NEWPORT BEACH — The Border Run International Sailing Event announced Feb. 6 that world-renowned America’s Cup designer Gino Morrelli will be giving a presentation at the event’s send-off party on April 5. Registration is now open for this year’s race. 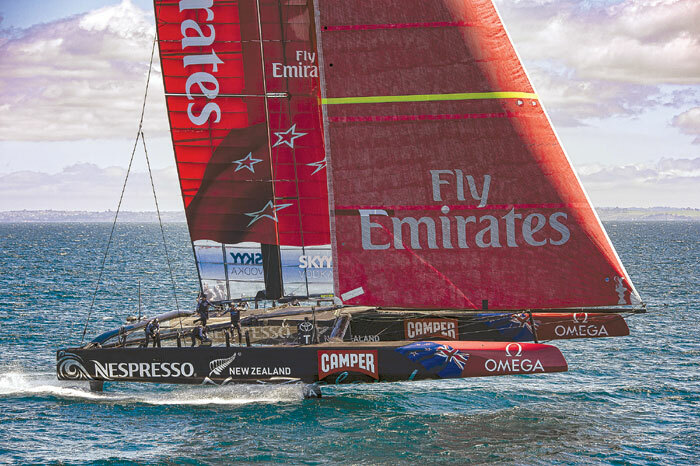 Morrelli, along with partner Pete Melvin, is an integral part of the Emirates Team New Zealand design team, a favored challenger for this year’s historic event. While his attention and focus is currently on building “the fastest 72-foot winged catamaran the world has ever seen,” Morrelli has been a major part of creating some of the most revolutionary and influential designs of the last two decades. Morrelli and Melvin made international headlines with their contributions to BMW Oracle Racing’s gigantic trimaran for the 33rd America’s Cup. Its waterline length was 90 feet — roughly the size of a baseball diamond — and it sported the largest hard-wing sail ever built. They were also the brain trust behind the late Steve Fossett’s record-breaking round-the-world journey aboard the catamaran Playstation. Morrelli and Melvin were lead designers in writing the new America’s Cup Rule, and Morrelli is a leading voice in the world of cutting-edge sailboat racing. Although Morrelli is an internationally recognized figure, his roots and friendships are here in Southern California. His connection to the Border Run goes beyond this speaking engagement. One of his longtime peers in this area is Border Run co-founder and fellow designer Randy Reynolds. The two worked together on the Reynolds 33 Catamaran that won Sailing World magazine’s coveted Boat of the Year award. And subsequently, Reynolds worked with Oracle Racing, and Morrelli and Melvin, when the team was getting up to speed on match-racing multihulls for the 33rd America’s Cup. Reynolds and the Border Run team are once again geared up to produce this year’s event. The multihull designer explained that he created the Border Run in response to a feeling that interest in sailboat racing was dwindling, and said he strove to fashion something that was inclusive in nature. With “where everyone’s invited” as the rallying cry, Reynolds said he and the Border Run team continue to put on races that aim, first, to promote the sport of sailboat racing. This year’s Border Run will be held off the coast of Newport Beach on the weekend after Easter: April 6-7. There are three courses to choose from: Newport Beach to Dana Point, Newport Beach to San Diego, and Newport Beach to San Diego via Coronado del Norte island. The event organizers are XSracing.org, South Shore Yacht Club, Dana Point Yacht Club and Shoreline Yacht Club of Long Beach. It is sponsored by Pirates Lair and Ullman Sails. To register for this year’s Border Run or get more information on the race, visit theborderrun.org or call (800) 366-8584.